Don't forget about the most essential part of your marine audio sound system... Speakers! 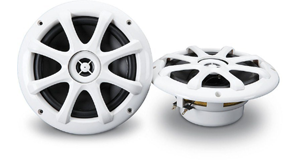 Our site offers a large variety of marine stereo speaker brand names and models. Our collection of marine speakers are water-resistant and have a special UV coating to avoid fading from exposure to the sun. These Marine Audio 5.25" speakers will give your boats audio system just the right amount of sound.